Six Kern Road high school youth, their sponsors Lane and Cathy, and three congregational delegates, Dave, Jim, and Vicki, plus Mark and Judy, attended Mennonite Church USA convention July 4-8 in Orlando. Some of the 13 KRMC attendees will share their responses to MennoCon17 next week during Sunday worship. In the meantime, a summary of what took place at the event follows, based on daily convention newsletters and reports from denominational news outlets. 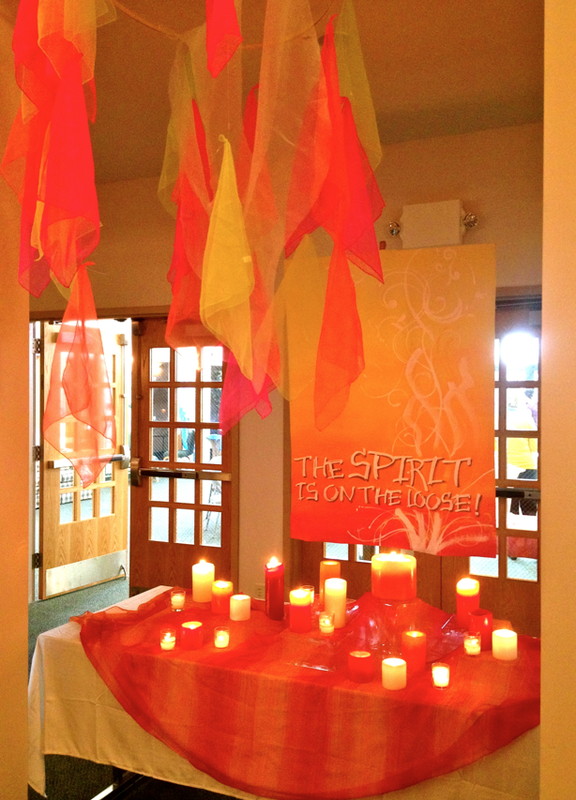 Convention music, prayer, ritual, conversation, and speakers explored the theme Love Is a Verb. The convention newsletter, Orlando Squeeze, posted Tuesday, Wednesday, Thursday, and Friday recaps of events here, including Servant Project highlights, a story celebrating 100 years of Mennonite Women USA, and an article about an inclusive worship service honoring victims of the 2016 shooting at the Pulse nightclub in Orlando, among many other reports. The official 96-page program book, offering youth and adult seminar topics, at-a-glance daily calendars, featured speakers, and special events, appears here. Speaking in the Thursday morning adult worship service, best-selling New York Times author and popular blogger Rachel Held Evans suggested that “responding in love isn’t about being nice or respectable, but is instead a matter of turning over tables: creating homes for refugees, bringing casseroles, marching with Black Lives Matter, and planting gardens in ‘urban deserts,’” according to a Mennonite World Review (MWR) article. Julia added that she sees significance in the fact that the play took place on “the first day of convention. The Doctrine of Discovery gives a glimpse of a history, including a Mennonite history, that is not pretty as it tells the story of a theology that gave privilege to whites at the expense, the genocide, of Native Americans. By beginning convention with this acknowledgement, the Mennonite church is making a statement. They are making a statement that church is more than worship; it is about doing life together, which means being in relationship with all of creation around us. It is about acknowledging past and present harm in order that reconciliation can occur and God’s shalom may prevail. A Future Church Summit Outcomes report is available online. We look forward to hearing personal reflections next week from KRMÇers who attended the Orlando convention. When national leaders continue to disappoint and the world around us looks to be in steady decline, what makes your heart sing despite less than desirable circumstances? I resonate this week with Parker Palmer’s assessment of the July 4 national holiday we will observe tomorrow. “On one hand, I celebrate all that is good about the U.S. and its people. On the other hand, I grieve the fundamental, perhaps even fatal flaws in our democracy that have been revealed by the diseased presidency and politics from which we now suffer,” Palmer says in his July 2 Facebook post. Before I read Palmer’s musings, however, last week’s tweet torrent threatened to drown me in despair, and I began practicing the spiritual discipline of noticing what brings joy even when the national/world situation seems grim. 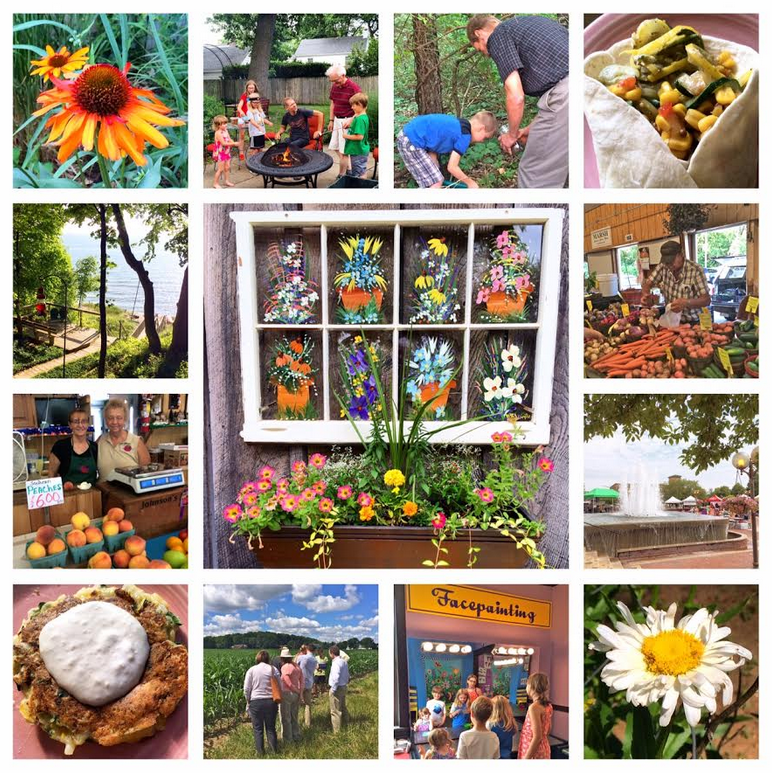 My first response was to compose a photo collage of what has energized me these last few weeks…in addition to the documentation of warm memories, I take great delight in making photos the best they can be. 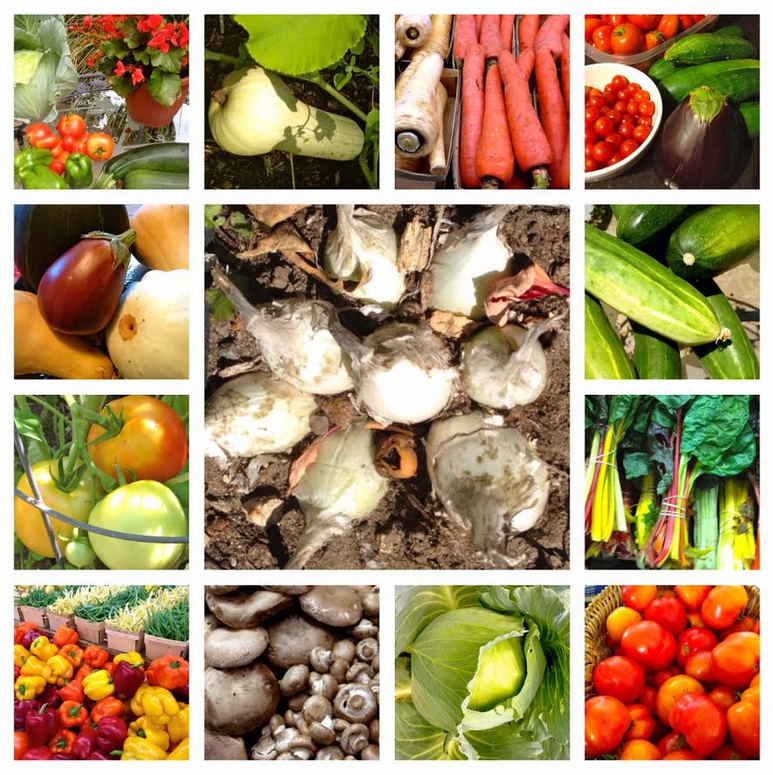 This week’s individual photos reveal that nature and family activate my happy places, so the South Bend Farmers’ Market, our own garden, and Matt and Jen’s new CSA, offered lots of fresh produce last week to create tasty summer dishes, which I love to photograph as well as eat. My once- or twice-daily visits to monitor blossoms on our property provide Instagram and Facebook connections via photos to other nature lovers. Bodies of water, like Lake Michigan and our own Saint Joe River, always lift my spirits. Weekly visits with family fuel my obsession to document and chronicle the growing-up years of the grandkids. Spending quality time with them at the library or Menno-Hof or the Saint Joe, MI, splash pad or Curious Kids' Museum or roasting marshmallows around our backyard brazier make lasting memories for all of us. Learning with fellow KRMCers about soil during our intergenerational nature-related formation hour last Sunday presented another happy moment and photo opportunity as we gathered evidence to substantiate sharings from this blog post about Kingdom teachings from soil. Connections, even to folks I do not know in person, make my heart sing. A Facebook friend whom I have not met except by phone walked me through upgrading security settings when she noticed my profile had been cloned last week. An Instagrammer I follow who claims color as her “superpower” brings me joy every day with her vivid posts, profiling her love of life in London. I treasure these interactions, especially when it feels like the world is collapsing in on itself and other countries’ trust in US leadership is falling to new lows, according to a recent Pew Research Center poll. Whenever I can, I attend South Bend’s Fridays by the Fountain in front of the Morris Performing Arts Center. This past week’s band did not disappoint, particularly after I noticed an aging gentleman (way beyond my years anyway) dancing by himself to Proud Mary. He wandered off when that number ended, but couldn’t resist hanging around a while longer for These Boots Are Made for Walking. Sitting on a ledge in the shade, sheltered from the hot sun, I watched happy human interactions unfold before me as a child and two older women took seats on the steps nearby. The child’s apple rolled away, and I imagined it might get tossed. Happily, one of the grandmas poured her own carbonated beverage over the apple and returned it to the child. The other grandma dipped her scarf in the nearby fountain to clean the child’s face after sandwich bites. Folks nearby enjoyed the two-year-old’s rollicking movement to Some Kind of Wonderful and Sweet Home Alabama (which the band changed to Chicago for the occasion) and her happy leaping down the stairs, jumping proudly from the last step to the ground. She warmed to her audience’s cheers and put on a magnificent show for us; the woman on the ledge next to me commented out loud that it was such a relief to be away from the political fray for a moment. Watching the many ethnicities and age groups (from infants in wraps and slings to octogenarians on walkers and canes) enjoying one another on their lunch breaks at Fridays by the Fountain functioned as an antidote to overdosing on the goings-on in Washington, DC. Kids blowing bubbles and families frolicking in the fountain mist, the kind word of a stranger, even the appearance of the Martin’s food truck added to the ambiance that raised my sinking spirits that day. Where have you glimpsed the Divine in simple human interaction? Indiana-Michigan Mennonite Conference annual sessions took place June 15-17 at Amigo Centre in Sturgis, MI. My long-time good friend Frances offered a meditation at the women’s tea Friday, bringing back fond memories of more than 20 years ago when the two of us attended summer worship courses at Anabaptist Mennonite Biblical Seminary (AMBS) and subsequently were invited by our suburban Chicago congregation to lead weekly evening worship in a contemplative prayer setting. The bond of our friendship grew as we fashioned themes, calls to worship, and prayers, crafted visuals, developed handouts, and invited readers and song leaders to join us in bringing the 30-minute services to a small group of faithful worshippers. Frances once remarked to the church’s office administrator, who observed our sometimes time-consuming set-ups, that getting ready for Wednesday prayer was for us as engaging as playing house is for young children. With the enthusiasm of kids working diligently at being grown-ups, we engaged wholeheartedly with each other and our subject matter to create space for quiet reflection and new awareness of the Divine in our midst. 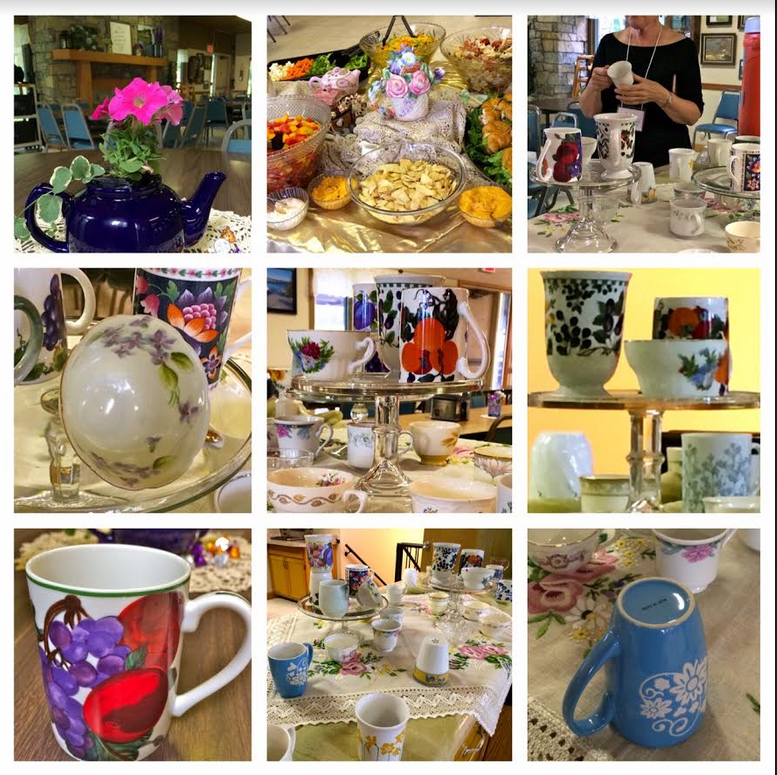 In preparation for her conference presentation based on Joyce Rupp’s book entitled The Cup of Our Life, Frances collected from a variety of thrift stores 45 unique teacups, some bright, some pastel, some stylized, some delicately floral, some mugs, some closer to actual teacups. As participants filled their plates and found a seat, they also chose a cup to use for personal reflection as Frances shared. During her after-lunch presentation, she asked us to consider why we selected the cup in front of us. Did we find the color or style appealing? Did the cup remind us of something? What about the cup connected to our lives? My mug, painted with brightly colored, realistically sketched fruits still on the vine with leaves and tendrils apparent, brought to mind the importance of authentic connections and taproot nourishment, so germane to generative living. Not until I sat with my mug at home, however, did that realization surface. Like the mugs and teacups we chose, our lives are sometimes marred by bumps, scratches, cracks, and chips, Frances pointed out, suggesting that rather than seeing these imperfections as flaws, we might view them as opportunities to nurture “understanding and compassion,” thus enabling change and growth. Back in the winter of 2007, I led an adult formation class based on The Cup of Our Life, gathering the chapter-by-chapter overviews below from the Rupp book for the class syllabus; ten years later, I find these snippets helpful to ponder anew and am grateful to Frances for bringing this book to mind once again. The Cup of Life: What would it be like if we believed we were a love song of the Divine? How would it change our presence with others? While healthy spirituality requires a deep belief in our own loveableness, this belief is not always easy to accept. May we find ways to see ourselves as songs of love, cups full of goodness, bringing life to others. The Open Cup: As we ponder our openness, what brave steps might we take toward emptying those things that perhaps keep our spiritual cups from being filled? How might uncluttering and making space for listening help prepare us to receive and trust? The Chipped Cup: How might we look at personal flaws, not to criticize, but to see what they can tell us about our relationship with the Divine and with others. How can we befriend parts of our personality we are reluctant to accept? The Broken Cup: Brokenness can be an instrument for change. Pain received rightly has the power to transform. What would happen if we met our frustrations, pains, and heartaches as we would meet a visitor having something to teach us? What might we learn from those pieces of our lives that are still wanting and incomplete? The Cup of Compassion: Sometimes compassion asks us to simply ‘be’ with someone. At other times, compassion asks us to ‘do’ something, to give of our time, to speak out for justice, to go the extra mile. And sometimes compassion asks us to receive graciously from another who has need of our receptivity and our vulnerability. The Blessing Cup: Each of us can be a blessing. When we bless, it is the deep and vast goodness of the Divine in us that blesses another. When we bless, we touch another with something of the Divine. How have you been blessed by the smiles, loving looks, stories and affirmations, concern and care of others? 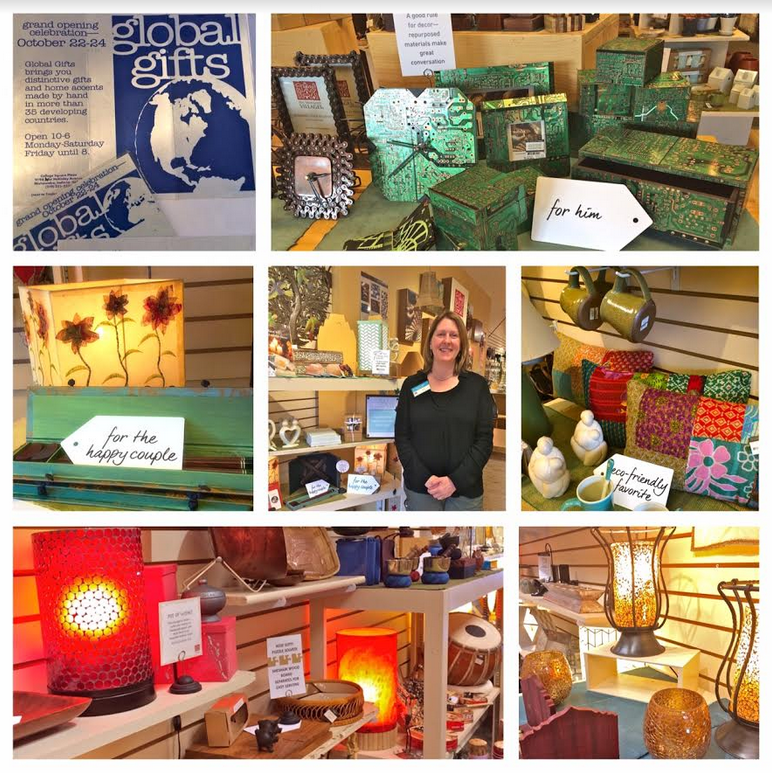 Ten Thousand Villages, a fair trade shop located at 214 W. Cleveland Rd., Granger, is in the midst of observing its 25th year in Michiana. Back on April 10, the store welcomed new manager, Kelly Tooker, another reason to celebrate during this milestone anniversary year. Born and raised in the Pacific Northwest, Kelly arrived in Indiana in the fall of 2011 when her husband Bob’s career brought the family here. She is no stranger to Ten Thousand Villages and its merchandise, having been a customer of the Portland, OR, store in the early 90s. Some of her Haitian cut metal wall art from back then has traveled across the country with her and is now on display in their fourth house and third state, according to Kelly. Kelly and her husband also celebrated their 25th anniversary this year. Kelly is a master gardener, has completed organics certification, and observes permaculture practices in her home garden. Before her move to Indiana, she worked in environmental services and taught natural resources and conservation at the high school level. She has more than 15 years of experience in retail management, most recently as the garden center manager at Lowe’s, and non-profit experience, most recently with Wellfield Botanic Gardens. She also has small business ownership experience, and managerial experience that includes work with volunteers. Kelly finds the store’s location a good one, with its proximity to University Park Mall and good foot traffic at Centennial Place, the shopping center where Villages is located. Nearby medical facilities regularly bring in patients from a distance, who stop in at the store before or after their appointments to further augment traffic, she said. She looks at the potential of local college students as both shoppers and volunteers, and hopes to establish campus ambassadors at Saint Mary’s, Indiana University South Bend, Bethel, Notre Dame, and Holy Cross. Current interest in yoga and meditation also brings customers to Ten Thousand Villages. Kelly emphasized that “Villages stores complete the fair trade cycle by providing a marketplace." She asks that you 'like' our Ten Thousand Villages Mishawaka Facebook page to help expand organic growth and exposure, and invites you to help with the fair trade vision by making grassroots referrals to family and friends about the store, its merchandise, and its mission, by volunteering in the store, by assisting with marketing, education, and community outreach, and by helping with off-site sales in the tradition of Edna Ruth Byler, the woman behind the Ten Thousand Villages fair trade concept, who began selling Puerto Rican and West Bank needlework from the trunk of her car in 1946. Starting today, the Mishawaka store’s Monday Facebook post will feature some aspect of its past history, drawn from photos, clippings, and other memorabilia saved in scrapbooks over the years by KRMCer Luella. “I truly believe that we are in this together. We must be the change we wish to see in the world and in our local communities,” Kelly said in one of her early e-mail communications with board members and volunteers. Speaking as the store’s behind-the-scenes Facebook presence, I find Kelly an accessible, inspiring manager/encourager who takes great delight in equipping volunteers to do their jobs. If you would like to volunteer with the Mishawaka Villages team, contact Kelly by phone (574.277.4900) or e-mail (Mishawaka@tenthousandvillages.com). To learn more about how fair trade improves lives and strengthens communities, see Villages’ description of its impact here. 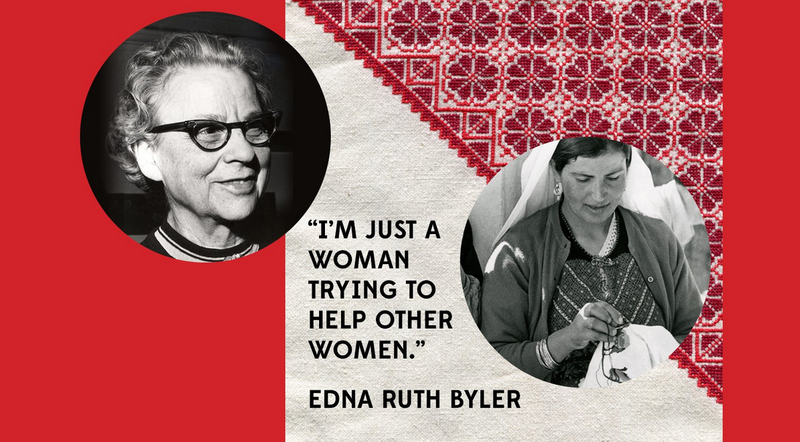 And this delightful Mrs. Green’s World podcast offers good listening about the “guilt-free shopping” available at Ten Thousand Villages stores, including more about Edna Ruth Byler. Indeed, a precious commodity, our earth and its soil, according to Danile, who suggested that the parable speaks of abundance as its farmer sows seed and waits, then trusts to a mysterious process, that process stimulated by rain and sun and good soil, soil made rich by earth worm castings and microbes trading nutrients for carbon created by plant roots. Collaboration and mutual nourishment, she reminded us, are hallmarks of how soil is formed and how the Divine works among us. Janice suggested in her follow-up musings that the parable prods us to think of soil as partner, co-creator with God. “The soil is an agent with God…paying attention to the soil is paying attention to God’s work” in the world. I heard Danile and Janice sharing that sentiment in their Sunday sermon as well. Have you experienced soil as portal that not only joins us to the world to come but simultaneously roots us more deeply in this one? Marty led us a mile and a half into and out of the woods Saturday on a western area group bird hike at Rum Village Park. We were not a huge group…eight of us, including Marty’s parents and a friend. Maybe not such a successful turn-out if numbers are your measuring stick. But participant numbers did not count on this trip, which fell on the morning of the Sunburst Races (billed as “one of the premier regional running events in the Midwest”), near the end of the Best. Week. Ever. in South Bend (meaning folks may have been tuckered out by the unceasing activity in our town), and just a few hours before a Catholic Worker/Near Northwest Neighborhood wedding to which a number of our area group families were invited as guests. Precise numbers of birds spotted did count for Marty’s report to ebird.org (Cornell Lab of Ornithology). His list revealed that, on our hour and a half walk, we saw 2 Mourning Doves, 3 Red-bellied Woodpeckers, 2 Downy Woodpeckers, 1 Eastern Wood-Pewee, 5 Empidonax (a genus, rather than a species, meaning Marty couldn’t quite pinpoint which of 15 species might have flown into view, though I heard him mention the Least Flycatcher on our hike), 2 Red-eyed Vireos, 2 Blue Jays, 2 White-breasted Nuthatches, 1 Wood Thrush, 6 American Robins, 2 Chipping Sparrows, 5 Northern Cardinals, 1 Common Grackle, 4 Brown-headed Cowbirds, and 1 American Goldfinch. We are grateful to Marty, who will start high school in the fall, for mentoring us by sharing his enthusiastic love of birding, which began just over a year ago, according to his father, on a family birding excursion. Marty taught us by example that seeing, listening, and record-keeping are important for would-be birders as well as persons of faith. He reminded us in advance of our hike that binoculars are key and demonstrated the importance of guidebooks, showing us, too, the pouch he created inside his sweatshirt to carry his guidebook! His knowledge of bird identification, bird calls, bird behaviors and habitats amazes me. Our morning together concluded at the Near Northwest Neighborhood’s Local Cup, a pay-it-forward coffee shop, where four more of our area group members joined us, including Homer and Betty, who were celebrating their 61st anniversary that very day; they took time earlier that morning to cheer on son Jim, who ran the half marathon. Jim arrived eventually (it was good to congratulate both him and his parents), and Turfena popped in to say hello from her home nearby. We all enjoyed meeting a retired Episcopalian priest who visited the coffee shop. He shared that he’s about to make a “very public announcement in agreement with the Paris Accord by installing solar panels” on his house. Vic, who spearheaded KRMC’s recent solar installation project, made a quick connection and they will be in touch. 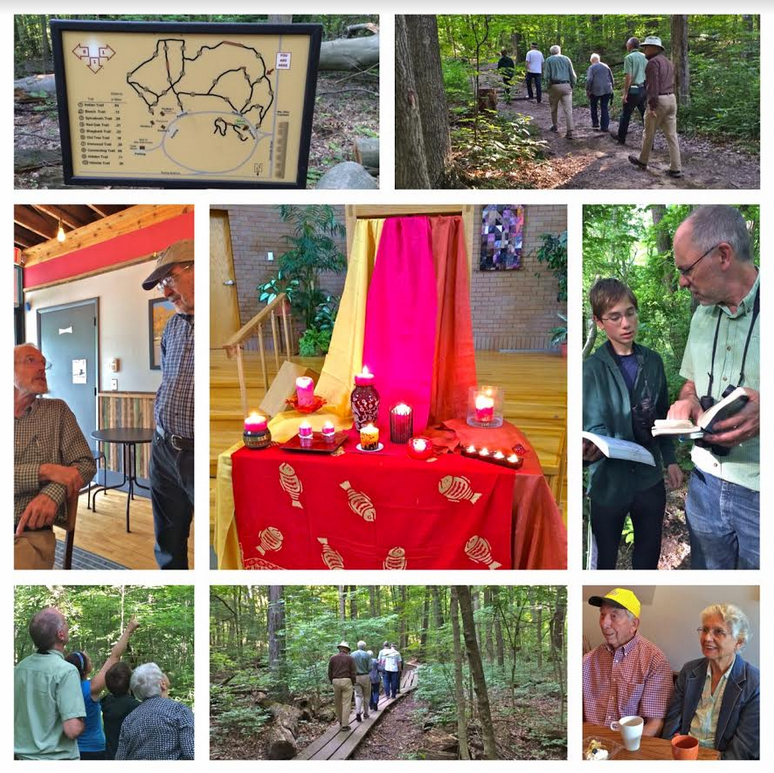 As I listened to Lane’s Pentecost sermon on Sunday and his proclamation that “Pentecost makes the newly birthed church a place of connection from God to people and people to God,” it struck me that our neighborly coffee shop connections, Marty’s mentoring, and the disciplines we began to exercise in birding are most certainly a part of Pentecost living. 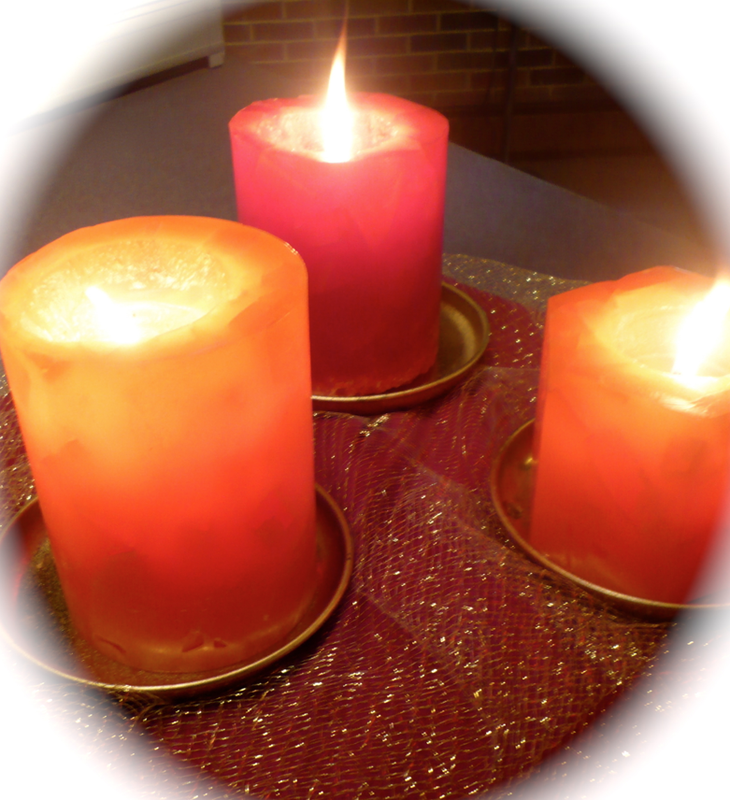 Next Sunday we will observe Pentecost, which falls on the seventh Sunday after Easter and marks, on the liturgical calendar, the coming of the Holy Spirit and the birthday of the church. The annual festival also invites us as individuals to notice Divine movement in our individual lives and calls us to share stories of the Spirit on the loose. For the disciples, now missing the physical presence of Jesus who had ascended 10 days earlier according to Biblical tradition, the descent of the Holy Spirit was a reminder that Jesus would always be with them; the wind and fire of the Spirit bolstered their courage to carry on the Kingdom work Jesus had begun. Pastor Janice’s sermon yesterday, based on verses 15-23 of Ephesians 1, seemed the perfect lead-up to next week’s Pentecost worship service as she spoke of how one’s personal sense of being the beloved child of God nourishes deep faith. She compared developing faith to the escalating nature of a fireworks display, referencing South Bend’s Best. Week. Ever. fireworks event coming Friday (see Best. Week. Ever. schedule here). The first lone firework catches our attention, and ultimately the show crescendos to a grand finale as excitement builds. In similar fashion, she said, “Something comes into our lives like that first firework; the fireworks of God’s love continue to go off, (though) sometimes with long pauses between,” she acknowledged. Based on the example set by my first spiritual director, I often have found myself asking a new directee whether or not she identifies as the beloved daughter of God. I recall journaling in bewilderment about that moment when my spiritual director asked me that question. Months, maybe even years later, the significance began to dawn on me, but initially, I found the question difficult to hear, imagining it presumptuous or perhaps even impertinent to claim myself beloved by the Divine. In what ways have you glimpsed the infinite, abundant companionship/love of the Divine and others on the journey? Have you taken stock of what might be impeding your view? Today, May 22, marks my youngest brother, Greg’s, 61st birthday. He celebrated his last earthly birthday 43 years ago just months before a single-car accident took his life on October 15, 1974, at 18 years of age. 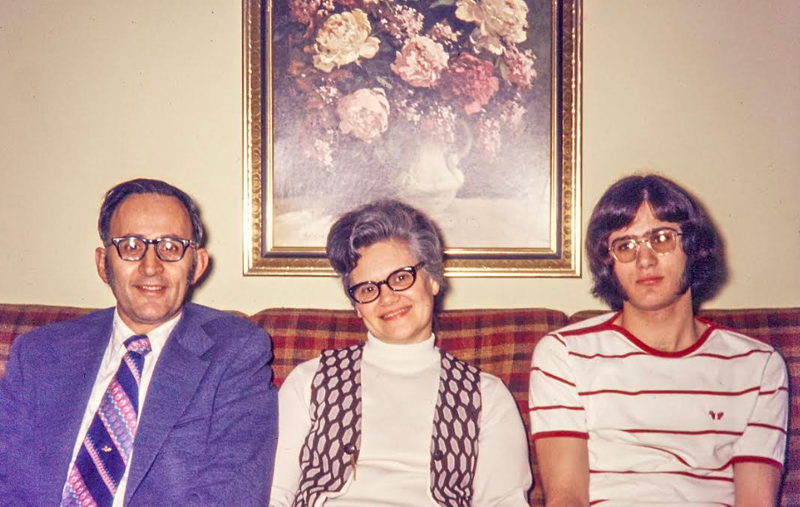 By happy coincidence or divine intervention, just in time for us to observe Greg's birthday, KRMCer Fred sent me the above photo three days ago of my mom and dad and Greg in their home back in the early 1970s. Fred’s dad Dan served as pastor at my parents’ church in eastern Pennsylvania from 1973-1978. An elementary schooler at the time, Fred does not recall much about Greg, whom he had known only a short time before Greg’s death. 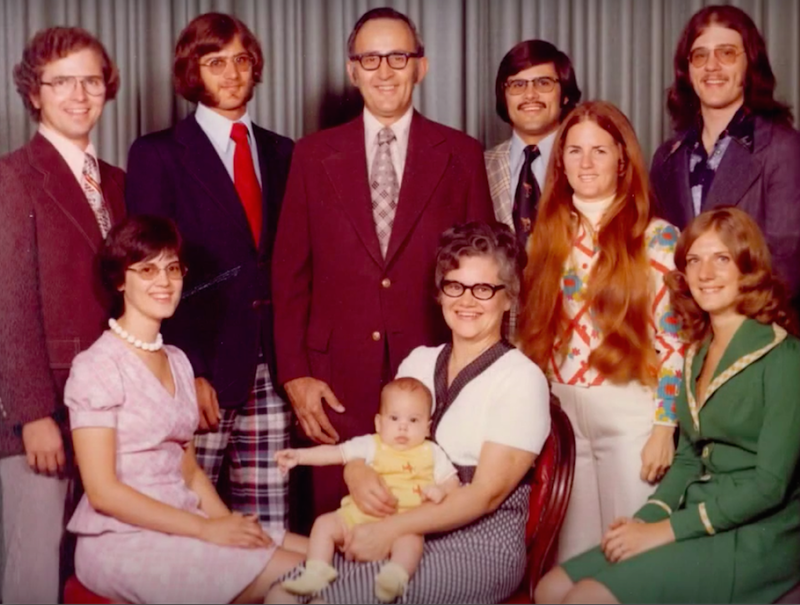 On the evening of the crash just a mile or so from home, my parents had arrived back from visiting us and our six-month-old son in our new home in Upland, IN, where Jim had taken his first job as an economics professor at Taylor University. Greg had helped us move in July with baby Matt, and we saw Greg again in August, when this family photo (below) was taken. My apparently superstitious great grandmother reminded us after Greg's death that it is not uncommon for someone to die after a family photo is taken. Mom and dad returned home to a police car waiting in their driveway. As a nurse with ER experience, my mother knew instinctively that their son likely already was gone after the police confirmed with them the kind of car he was driving. The shocking news reached us at midnight that evening, and we left the next morning for the long trip back to the distant suburbs of Philadelphia, stopping for a short time in central PA to visit briefly with our former small group in State College where we had spent the last five years. Greg’s death came 12 years after another bereavement that numbed me to the possibility of experiencing new pain; almost no processing about the two consequential deaths took place for many years, but, after meeting a companion for the grief journey seven years ago, the unfolding of the first loss began, eventually sparking momentum to delve into unpacking the untended grief around my brother’s death. During a visit this past April to see mom and dad in their personal care unit at a Mennonite retirement community, brother Tom crossed paths, quite serendipitously, with a volunteer fireman who was an emergency responder at the scene of Greg’s accident. Now 75 years old and mayor of our small hometown, the fireman shared his memories of that night over lunch with me this past week; I could feel old grief beginning to green to gift and grace as he recounted how the fire department got a call on that fateful night from the county to a “rescue” operation, meaning there was a chance the victim might be alive. The story our family had been told these many years mentioned a Catholic neighbor who reportedly heard the crash and went outside to where our brother lay on the ground, still breathing. She stayed with him, the story goes, until his heart stopped beating. In my mind, I see her tenderly holding his hand, but I can’t vouch for whether or not that part is fact or wishful thinking. According to police reports, our brother had passed a car on wet streets and, on returning to his lane, apparently had been thrown off the highway. These many years later, the mayor confirmed that, yes, Greg appeared to have flown out of the car (before seat belts were required) landing on his back, at which point the car flipped upside down on top of him. At 33 years old then, the mayor recalls thinking, “Greg is so young; this can't be.” Noting that this was his first experience with the death of one so young, the former fireman also remembered compassionately that “he looked so peaceful,” a gift for family to hear so many years later. After I told him a tiny bit about the grief work I’ve been doing the last seven years, the mayor shared about losing his own dad at 16 while they were playing ball together, losing his first wife to breast cancer when she was 42, and now standing strong by his daughter as she confronts breast cancer at 49. I was struck by his willingness to be vulnerable with a near-stranger, though not surprised since we had shared stories of personal pain with one another. We certainly didn’t call our interaction over lunch that day communion, but it definitely was a kind of breaking bread together. The mayor thinks he may know the neighbor woman who crossed the street to companion Greg in his last moments. She is now in her early 80s, of sound mind, and still lives in the same house. “I run into her now and again,” he said. “I’ll ask her if she was there.” If she is the one who stood by our brother so graciously in those final moments, I will be in touch so that the green shoots of redemption might continue to yield gift and grace. My parents, brothers Tom and Dave, and I continue to celebrate Greg’s birthday in gratitude for the 18 years of life given him, the all-too-brief time we shared together. We remember him well in a variety of ways...by excavating our own pain, by speaking of him and learning more about the accident which took him from us so suddenly, by sharing memories with others who knew him. Mom and dad are forever grateful for the two years immediately after Greg's death during which his high school friends visited every Sunday night seeking companionship with each other and mom and dad in this loss. High school friend and band compatriot Eric told us again just this past weekend that he continues to jam with Greg’s (and the band’s) music from all those years ago. Meeting Greg’s high school friend Ted unexpectedly at church Sunday morning added another mystical moment to the birthday weekend, not to mention the fact that friends from so long ago in State College showed up as visitors at the same church Sunday where I was a guest and recalled that we returned in October 1974 on the way to my brother's funeral, without knowledge that today is his birthday or that I was preparing this post. That all of these moments took place on Greg's birthday weekend are indeed sparks of light in this resurrection season! In what ways have you experienced gift and grace emerging from past personal pain? How has the Divine led you to new landscapes in the midst of aches you once feared would devour you?